Praised for its broad spectrum of musical styles and genres! Rolling Stone 500 Greatest Albums of All Time - Rated 399/500! 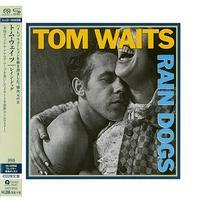 Rain Dogs is Tom Waits' ninth album, originally released in 1985. It is a loose concept album about the people who live on the streets of New York City, the so-called urban dispossessed. This album is generally considered the middle album of a trilogy that includes Swordfishtrombones and Franks Wild Years. On the album, Waits works together with both Marc Ribot and Keith Richards for the first time. Many times would follow including Waits' latest album Bad As Me. Rain Dogs is praised for its broad spectrum of musical styles and genres, described by Rolling Stone as merging "Kurt Weill, pre-rock integrity from old dirty blues and the elegiac melancholy of New Orleans funeral brass, into a singularly idiosyncratic American style." SHM-SACD format (fully compatible with standard SACD player, but it does not play on standard CD players) that enhances the audio-resolution. Japanese pressing. • Two-channel SACD layer only, to secure enough reflectance and not to compress DSD file. • Label of the disc is printed with a special green ink called 'Onsho Shiyou,' which minimizes diffuse reflection. • Carefully selected master audio is used, from existing DSD files to newly converted audio from analog tapes.